Taksirat is an annual music festival in R.Macedonia with a 15 year tradition, dedicated to alternative rock, pop, electronic, and in particular, it has always strongly supported reggae and ska. This is not an everyday music event. On this event Skopje gets out of the grayness of everyday life, to stand on behalf of what makes people happy. The whole festival lasts for one week, usually from 27th of November – 5th of December and it is located on different cultural locations in Skopje. Besides the main music program, the festival is enriched with off programs like art performances, art films, theatre plays, music conference, social campaigns that promotes positive values between the youth population (No Guns, Stop AIDS, Be A Volunteer), promotion of new music releases, introducing young and un-established artists with the audience, etc. Through the years "Taksirat" grew up in a very successful event which was 4 years in a row nominated for best festival in different categories on "Europe Festival Awards" and "UK Festival Awards". Also it is famous for its very cheap tickets in comparison with the importance of the event. 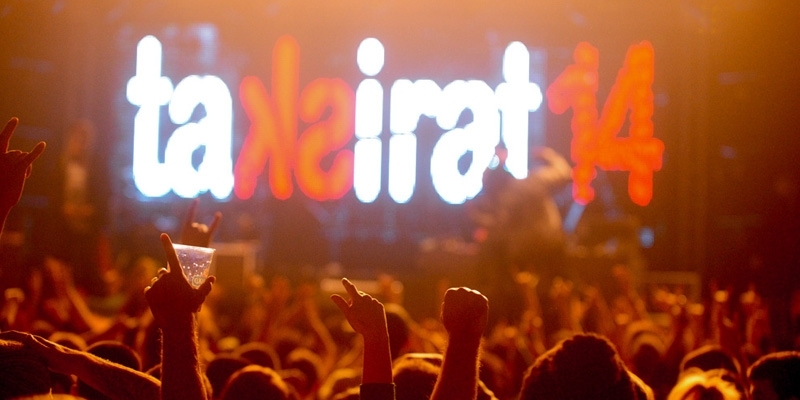 TAKSIRAT is the first and only festival from Macedonia which became a member of The European festival association – YOUROPE. By now the TAKSIRAT FESTIVAL team featured players of the caliber of Juliette Lewis, Moonspel, Parov Stelar, Skindred, Tanya Stephens, Elemental, Hladno Pivo, Guano Apes, Kiril Djaikovski, Che Sudaka, T.B. Tracheri, Delinquent Habits, FIST, Zea, Kanipchen-Fit, Denny Te Chuva, Z/Buka, Risto Gushich, Beda Express, Foltin, Eye Cue, Weding dub., Fun Lovin' Criminals, Haustor, Laibach, Rambo Amadeus , The Strangles, Wailers, Athena, Let 3, Darkwood Dub, Zabranjeno Pushenje, Kreator, Iggy Pop & The Stooges, DJ Timo Maas, Kultur Shock, Edo Maajka, Disciplina Kichme, Fat Joe, Asian Dub Foundation, Clawfinger, Buraka Som Sistema, Kaiser Chiefs, B Real & Psycho Real ,Тiga, The Roots, Marky Ramone, Audio Bullys, Swayzak, Neville Staple (the Specials), Buzzcocks, Superhiks, Bernays Propaganda, Foltin, Ljubojna, Manu Chao La Ventura, Gentleman & The Evolution, Onyx, White Lies, Pekinška Patka, Dubioza Kolektiv, DJ Premier, Ferry Corsten, Mizar, Bei The Fish, String Forces, Phat Phillie, Diskobajagi, Fonija, A Venus Fly Trap and many more..